Coyotes are extremely social animals. They live in family groups and have about a dozen different known vocalizations used to communicate with each other. Their Latin name, Canis latrans, literally means “barking dog.” Across Vancouver at night, you might have heard their wild-sounding chorus of yips and howls as coyotes paired up in their annual mating rituals over the past month. Coyotes even utilize non-verbal communication—such as scent marking—to claim territories. When coyotes encounter each other, they send messages to one another through their body language, too. 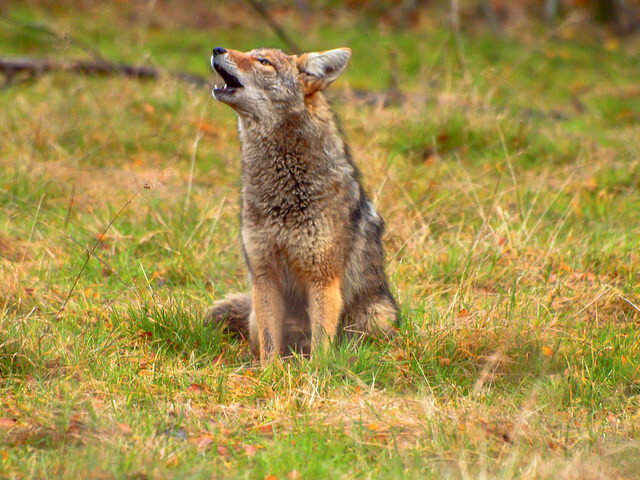 Ears forward versus backwards and head up instead of low are tools that the social coyotes use to communicate. Inspired by all the various ways coyotes socialize, the Co-Existing with Coyotes program is getting social, too. We just launched a Co-Existing with Coyotes’ facebook page. Give us a “like” and follow us to keep up to date with weekly coyote facts and co-existence tips. We’ll keep you in the loop about outreach events and coyote happenings across Vancouver. In today’s social media world, your ‘likes’ and ‘shares’ go a long way to help spread our messages to a wider audience. In a few weeks, female coyotes will give birth to new pups—adding to their social group. We hope you’ll give us a like to add to our social group, too! Our goal is to inform as many people as we can about urban coyotes to help keep people, pets, and coyotes safe. Thanks for your support.